Stop me if you’ve heard this one before: Norton protection slows down my computer. True enough — in 2004. But a lot has changed since then. You don’t see a lot of fluffy boots anymore, for instance, and Paris Hilton no longer dominates the news. What else has changed? Norton protection has been rated No. 1 in performance for 12 consecutive years by PassMark, a leading tester of software products. That means you won’t notice a difference in speed if you have Norton protection on your device. You probably want two things when you buy security software. Speed and protection. Speed? We covered that. No one wants their computer to load in the time it takes to eat a pizza. And if you’re a gamer, you probably have even less patience. Protection? You want your security software to protect against threats like computer viruses, malware, spyware, and ransomware. Norton Security protection does that. And it does it fast. OK. We understand. Old habits die hard. But that leaves us no choice but to present a numbered list. This list could have been avoided, but anytime anyone says, “Norton protection slows down my computer,” a Norton engineer screams. It’s our speed team’s No. 1 priority — Norton Security’s engineering team measures the performance of every new program version. Here’s what you get. Consistency, for starters. Plus, the lowest impact on performance compared with competitors when it comes to everyday uses of your devices. High protection used to mean low performance. Not anymore. 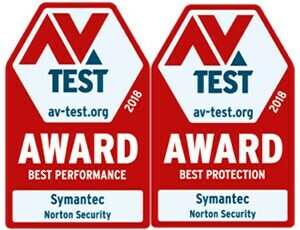 Norton Security has been rated the Best Protection security product in the industry for three straight years. That’s according to AV-Test, an independent institute that tests antivirus software. As for the protection-vs.-performance question, Norton Security gets kudos for innovative technologies that challenge the tradeoff and deliver speed. We noted Norton’s winning streak for performance. Now the details. Norton protection was rated No. 1 in performance for 12 straight years by software testing company PassMark. It means Norton protection has the lowest performance impact on 23 common daily operations on PCs. That includes things like download speeds and web-browsing speeds. In security software programs, as in life, timing matters. Norton’s “protection scanner” feature minimizes performance impact by monitoring your system and your activities. How? It tracks your system resource usage to decide the best time to perform essential software updates and scan your files for viruses and other threats. Bottom line: You get computer performance during your busy times, while Norton protection does its work during idle times. As everybody knows, optimization is, well, optimal. So, engineers optimized Norton Security for solid state drives, as well as conventional hard disk drives. That’s not all. The team also tested and optimized for the latest web browsers. That means Norton Security provides its best protection with the least impact on web browsing. Still a nonbeliever? Consider this possibility: You might think Norton protection is slowing down your computer, but it could be something else, or a combination of things. Here are a few things you can do that might help you boost the performance of your computer or laptop. Make sure you install the latest versions of your Norton Security solutions. Update your web browser. You can check your settings to confirm you are running the most-current version of your browser. Check out Norton protection’s Performance feature. It shows you what could be creating performance delays. It also lets you to take actions like optimizing disks, cleaning up files, and editing system startup items — all in the name of speed. Contact Norton Support. They can check to see if your settings are optimal. You can reach Norton Support by phone, email, or chat. We hope this sets the record straight. Just to make sure, let’s end with a quiz question. True or false: Norton protection slows down my computer. If you answered “false,” you are correct. If you answered “true,” you may be wearing fluffy boots.